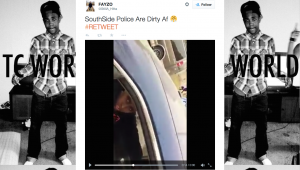 A brief cell phone video posted on recording artist Fayzo’s Twitter page, captures the discussion between a Minneapolis Police Office and a suspect apparently being placed in custody. The officer denied to answer the suspect’s question about why he was under arrest, and also threatened to break his legs if he attempted to escape. MINNEAPOLIS (April 3, 2015) — The Minnesota chapter of the Council on American-Islamic Relations (CAIR-MN) on Friday called on the U.S. Department of Justice to investigate a video of a Minneapolis, Minn., police officer apparently threatening to break the legs of a suspect if he attempted to escape. The Minneapolis Police Department is conducting a police internal affairs investigation of the incident. No news releases or statements were issued regarding the incident from the MPD or the City of Minneapolis.